This stopwatch features a mechanical, single-hand, hand control single-acting and interrupted movement. The stopwatch is designed for measuring time intervals in minutes, seconds and fractions of a second. 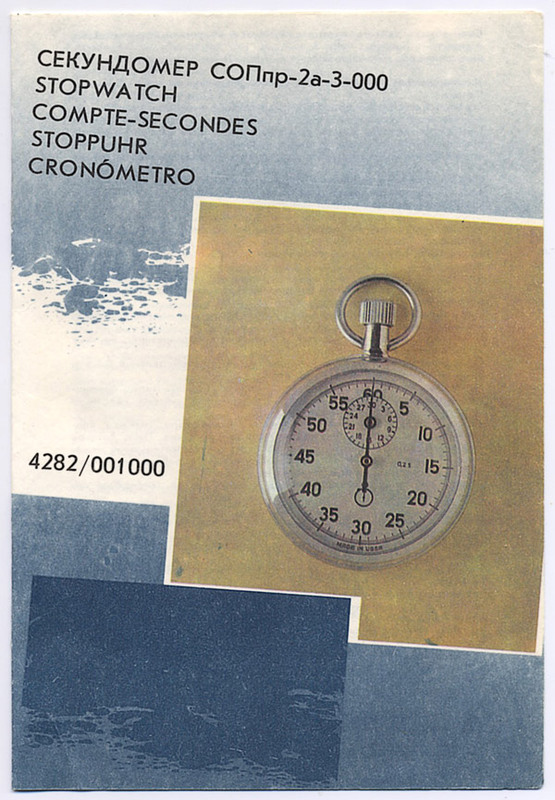 The stopwatch is used at sports competitions, researches and timekeeping. The stopwatch has a 60-second dial with 0.2 s division value and 30-minute recorder of 1 min division value. The 42 mm calibre, 15 ruby jewel movement is provided with spring actuator, lever escapement and balance-hairspring oscillatory system with a cycle of 0,4 s. Special single-acting lever device facilitates the stopwatch hand control. The stopwatch is started, stopped and its hands are reset to zero by successive pushing the winder. The stopwatch run after a complete winding of the mainspring is at least 18 h.
The dial is coated with white enamel, figures and hands, with black enamel. Zeit ist das, was man an der Uhr abliest. Albert Einstein.